We are almost in the thick of the holiday season and preparation has been underway over here for a few weeks already. 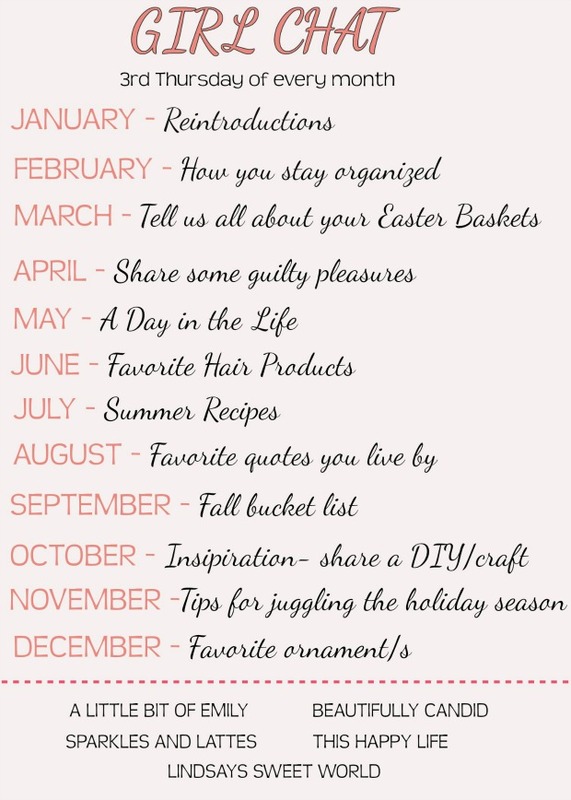 With so much going on this time of year, it’s easy to drop the ball on something so it’s important to stay organized! Here are a few tips from me, the organizational queen (as I’ve deemed myself – hehe), to ensure that your holiday season runs smoothly. Y'all know I love a good post about organizing! With school events, Christmas tree lightings, dinners, holiday plays and shows, parties, get-togethers, traditions, bucket list to-dos, and loads of other events to attend this time of year, it’s so important to WRITE EVERYTHING DOWN. I cannot tell you how many events end up overlapping for us this time of year so it’s of utmost importance to use the same calendar to write down all events so you don’t double-book. Just the other day I went to write down a new event that we wanted to attend, but when I went to put it on my calendar I saw that we already had an event planned for that evening. Now we just have to decide which one is more important and make a choice, but at least we didn’t commit to something only to realize we couldn’t attend. I pull this list out each year and transfer all of the events and to-dos to my planner which ensures that nothing is forgotten. This also enables me to spread stuff out evenly throughout the weeks leading up to Christmas so that way we’re not trying to cram everything in at the last minute. I love having this complete overview of the season and spreading everything out over the 6-8 weeks before Christmas significantly cuts down on stress. I don’t know about you, but we have a ton of people who we buy gifts for every year… parents, siblings, the kids, the kids’ teachers, kids from our outreach program at church, etc. Each year around September, I make a list of every single person for whom we have to shop. I leave a few blank spaces in between each person’s name so I can write down gift ideas in pencil, and then when I actually purchase the gifts, I write them down in pen along with a running total in pencil of how much we’ve spent on each person. Once I'm completely done shopping for someone I cross their name out in pink highlighter. This method really comes in handy for the kids since we are buying stuff for them for several weeks leading up until Christmas. This ensures that we don’t overspend and it also ensures that we spend around the same amount of money on each of them. 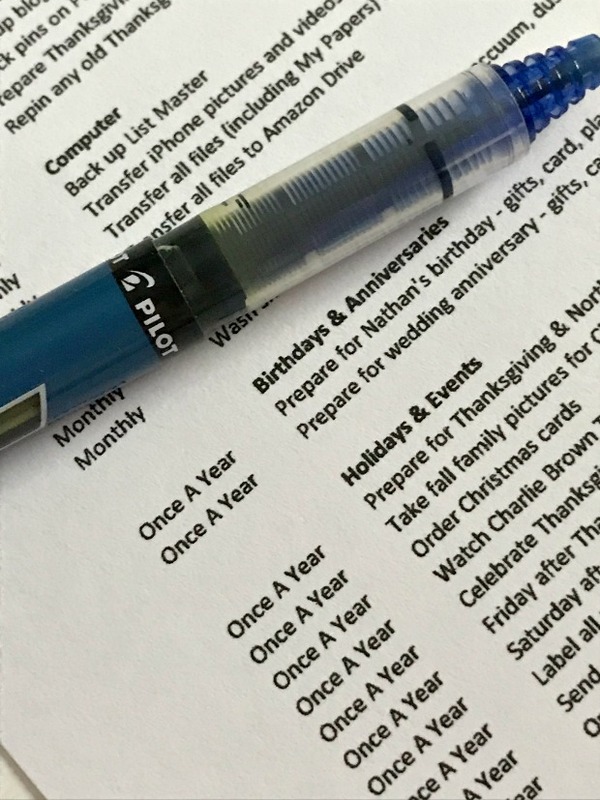 Now that you’re organized to the max with all of your lists, you just need to make sure that you stick to the plan! You can be as organized as you possibly can and still forget something. That’s why it’s important to set reminders! When in doubt, put a reminder in your planner (or set an alarm on your phone) a couple of days before something important has to be done and then set one more reminder that day to ensure you don’t forget. Anybody else receive visits from that pesky little elf?! Haha. I have used this method for several years now and it really works for me. 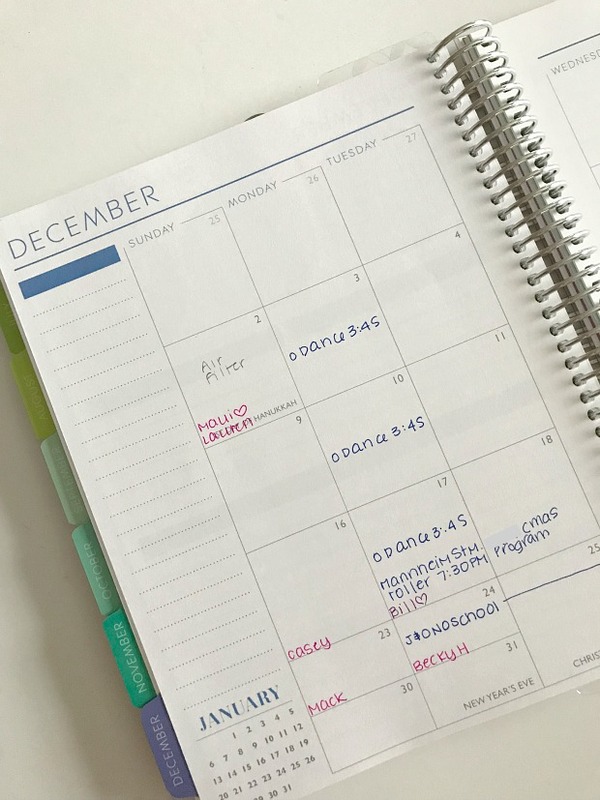 How do you stay organized this time of year? I am the same way with list. I make list for every freaking thing. If I don’t write it down it won’t happen! How to you plan your blog content?? I also make a list of who I'm buying for and how much I've budgeted for them. Then I write down what I actually spent and bought for them. I keep this list in my purse (just on a sheet of paper!) in case I'm out somewhere and buy something. I love buying presents for others!! I love how neat you write. i'm jealous lol. I love how you do this stuff tho! perfect way to stay organized all year long! LOL at moving the elf. Glad I don't need to worry about that one, I'd for sure forget! Right now I have a list on notepad on my phone of the things I'm hoping to get my kids for Hanukkah and I put check marks in when I have the gift in my possession! I have used the app Santa's Bag for the last few years and it is a life saver! You put in recipients and a budget then go in and put ideas throughout the year. You can put gifts in for each recipient with a price, whether it was ordered or purchased, what store, where you hid it, etc. You also can archive each year! This is why I do not have the elf in our house! But love the list, we do this as well. 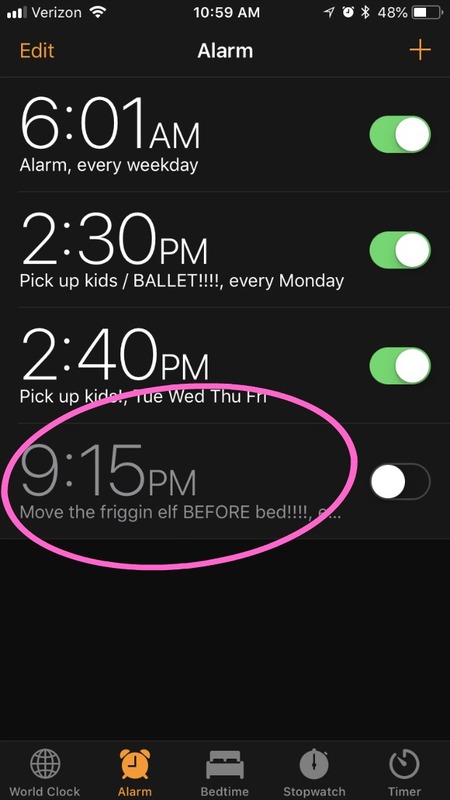 I set an alarm in my phone to move the elf too. that is too funny. I am all about making the lists. I have way too many holiday lists going right now. "Move the friggin elf before bed," Bahahahahaha! I had to make a list within the lists of lists of ideas for the elf so that I wouldn't become frantic every night. Hahaha! Shoot, I should have shared that today. 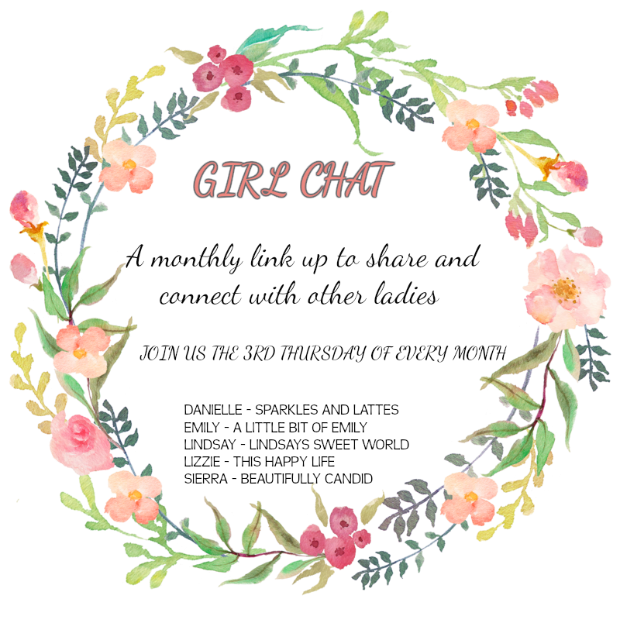 I'm determined to have it all together for Christmas this year, so thanks for sharing your Christmas organizational ways - lots of great ideas!!! I loved this! Girl, if I don't have it written down it doesn't get done! My short term memory is terrible! You know, I honestly have no idea how to set the alarm on my phone; but I definitely need it for that darn elf. Last year I had a real problem because now my boys are often staying up later than me! Ahhhh yeah I don't know what I would do if I went to bed before the kids. I would have to retire the elf before it got to that point. Haha. The elf alarm is genius. I will be implementing that ASAP! 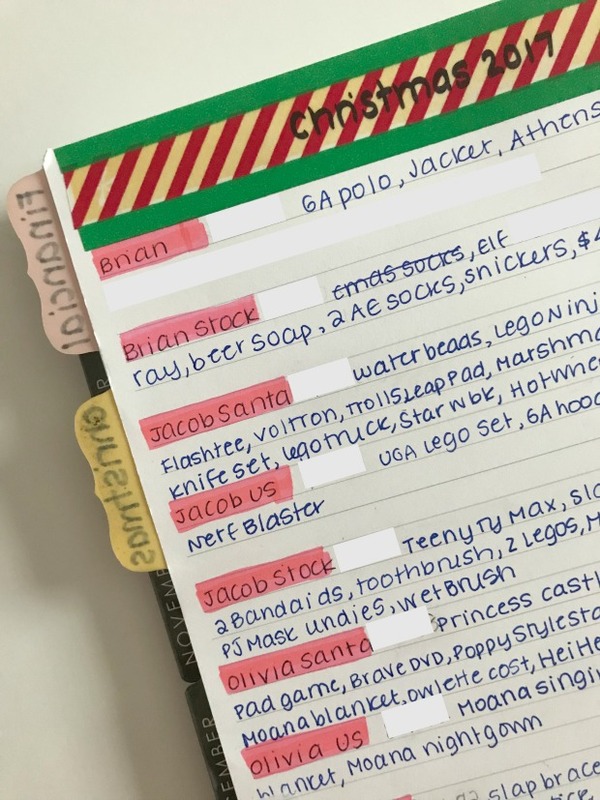 Such a great idea to have a master list - I really need to get on that band wagon...it seems like you are always talking about your master list and how helpful it is!! And yes, alarms for me are key - I always use them at work on emails, like if the next day is someone's birthday and I need to bring something in, I always have a reminder go off right before I leave work so I remember!